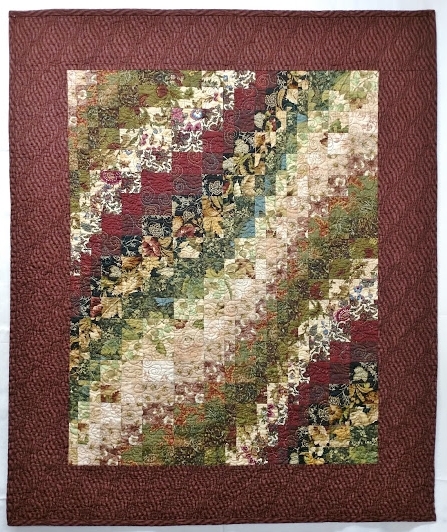 This is the first in a series of sew/quilt-along posts about making a bargello quilt. For a little more background information, you can check out my previous post, Colorwash Bargello. For this series, I’ll be referring to the Cascade pattern from my book Colorwash Bargello Quilts. If you don’t have the book or would rather design your own bargello quilt, you can still follow along and find a lot of (hopefully!) helpful information. This has been one of my most popular bargello classes, as it can easily be completed in a day (or two days, if you are having lots of fun with your friends). What makes a quilt a bargello quilt? And what does colorwash mean? Centuries-old bargello needlepoint, also known as Hungarian point, flame stitch, or Florentine work. Colorwash/watercolor quilting designers in the early 1990s such as Deirdre Amsden, Pat Maixner Magaret, and Donna Slusser. I also recognize the influence of traditional quilt patterns such as Trip Around the World and Star of Bethlehem or Lone Star when the makers have used gradations of color and/or value in their fabric layout. 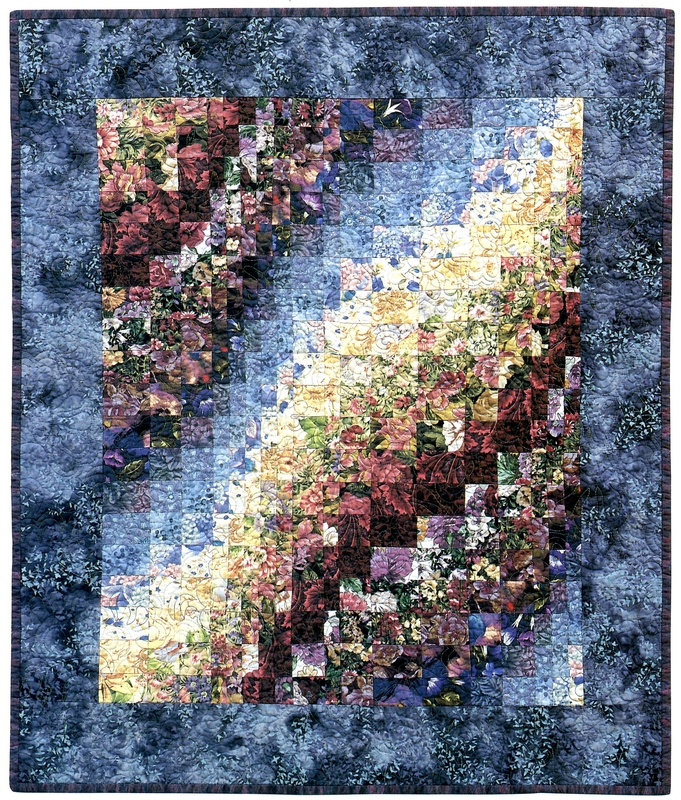 In my bargello-style quilts, I emphasize blending the colors and visual textures of the fabrics to create smooth gradations and transitions or “washes” of color across the face of the quilt, punctuated at intervals with areas of higher contrast. Close-up of Aurora pattern from Colorwash Bargello Quilts showing gradations from light to dark and back again, as well as areas of higher contrast. 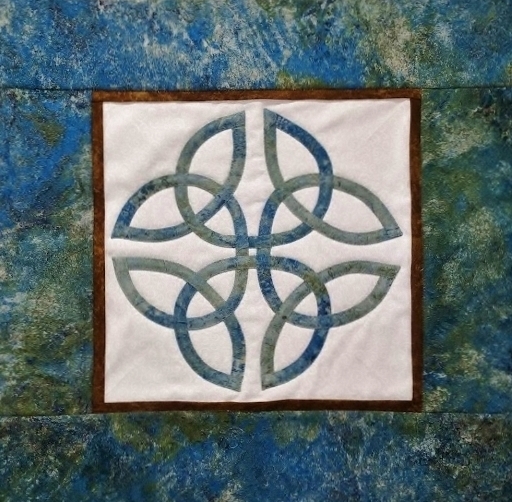 The True Lovers’ Knot from Celtic Quilts: A New Look for Ancient Designs – appliquéd and ready for more quilting! 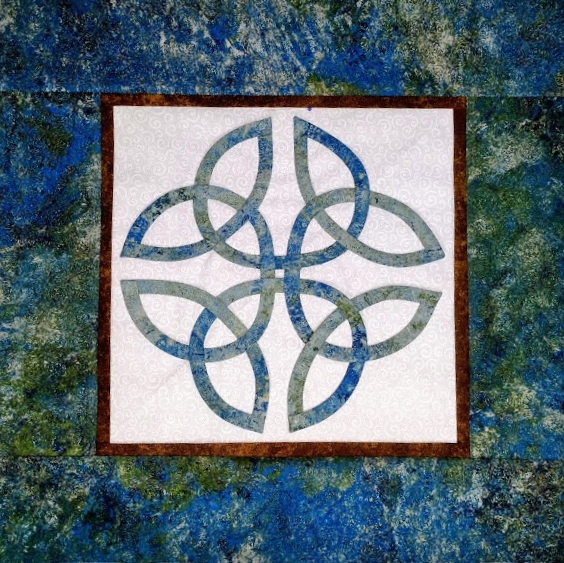 This is the tenth in a series of posts that will take you step-by-step through the process of creating a Celtic Quilt. The lines that form my Celtic and Celtic-style knotwork designs are formed by cutting bias strips of fabric and sewing them into tubes, which are then fused onto background fabric. For this project, I added the borders, layered the quilt top with batting and backing, and machine appliquéd and quilted the design in one step. Now I’m ready to add a little more texture! Since the design itself has already been appliquéd and quilted in one step, I’m going to start this stage by stitching in the ditch between my borders. This will further stabilize the quilt and help keep my borders straight. I usually recommend a walking foot for this step, but my layers are flat and stable enough that I am going to continue on with my standard presser foot. Stitching in the ditch in the seam between the borders. Working my way around the design, including sewing down the folded edges formed when the points were created. 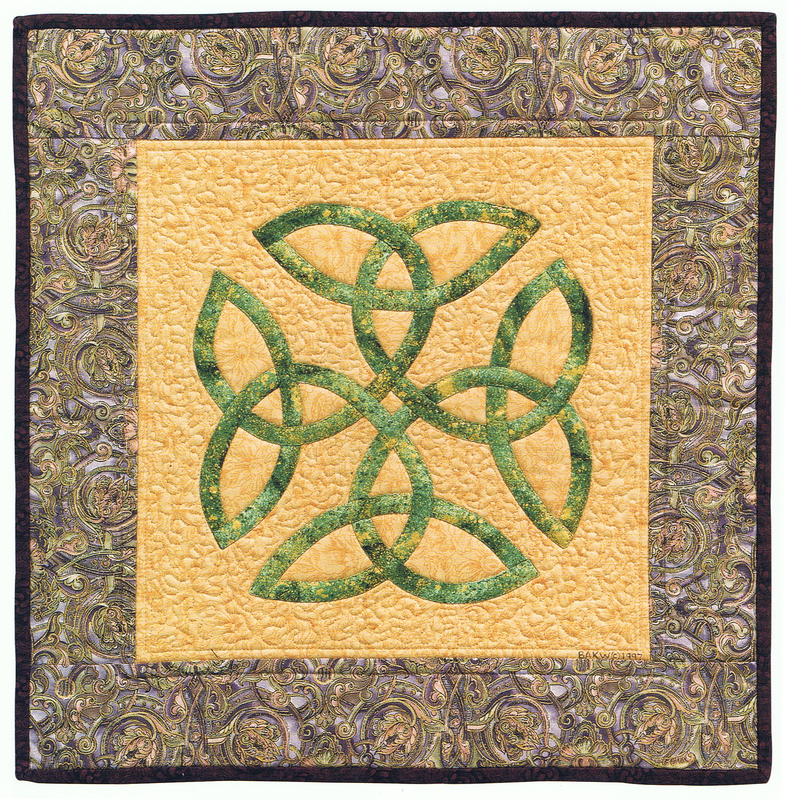 This is the ninth in a series of posts that will take you step-by-step through the process of creating a Celtic Quilt. The lines that form my Celtic and Celtic-style knotwork designs are formed by cutting bias strips of fabric and sewing them into tubes, which are then fuse-basted onto background fabric. You can choose to appliqué the design (sew everything down), add borders, layer the quilt top with batting and backing, and then quilt by either hand or machine. Or you can choose (as I usually do) to add the border(s), layer the quilt top with batting and backing, and then machine appliqué and quilt in one step. In 20+ years of teaching, this is the monofilament thread that seems to work the best in the greatest number of machines. 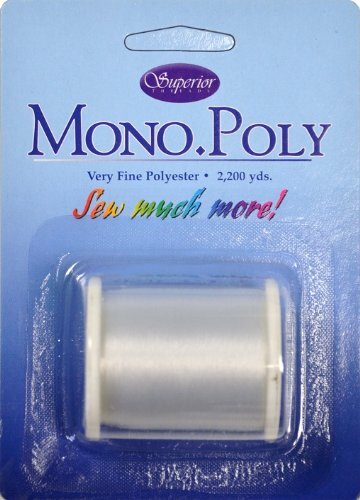 I recommend a .004 polyester or nylon monofilament thread for your top thread. In teaching various appliqué classes for more than 20 years, I have found the single brand that seems to work best in the greatest number of machines is MonoPoly by Superior Threads. That said, I have also had students use Wonder Thread, YLI, and even Sulky successfully – it all depends on what works best in each particular machine. I never use monofilament in the bobbin. Instead, I prefer a high quality 50 or 60 weight, 2 ply cotton, or a high quality 60 weight poly such as Bottom Line by Superior Threads. Using a relatively finer thread in the bobbin instead of an all-purpose 50 weight, 3 ply cotton thread makes it easier to avoid little dots of bobbin thread being visible on the right side of your work. (3) stitching slowly and steadily – avoiding abrupt stops or speed fluctuations that might cause the spool to spin. Note 2: If you’d rather avoid monofilament, you could opt to use Bottom Line, or a 50-60 weight, 2 ply cotton thread in both the top AND the bobbin – just match the color of the thread as best you can to your appliqué fabric(s). Silk thread is also WONDERFUL, but can be pricy. Choose the right tension settings. Many machines now have automatic tension control, which generally does a very good job adjusting to whatever kind of thread you may be using. However, when it comes to monofilament thread, even high-end machines may need some minor adjusting. On my own machine, I find it helpful to lower the upper thread tension to between 1 and 2 when I’m using monofilament thread as the top thread in my machine (auto-tension for my machine is set at 4). 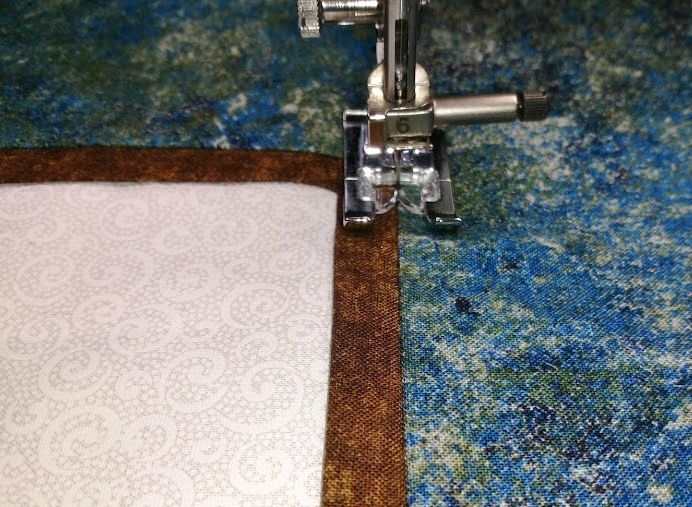 For more on thread tension and when and how to adjust it, see this machine quilting post: Machine Quilting FAQ & Top Tips. 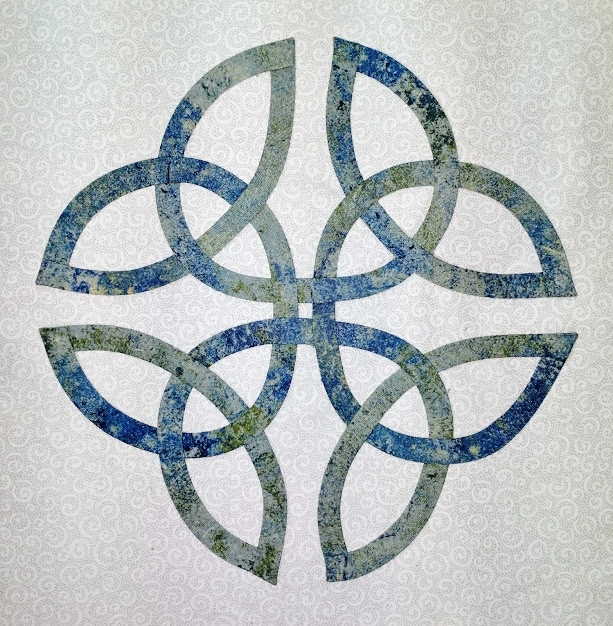 True Lover’s Knot (on point) from Celtic Quilts: A New Look for Ancient Designs – Now ready to layer with batting and backing! This is the eighth in a series of posts that will take you step-by-step through the process of creating a Celtic Quilt. What kind of batting do you prefer? 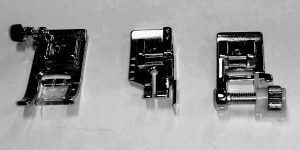 It is also particularly helpful not to have to deal with pins (as in pin-basting) potentially getting caught on each other or on the presser foot as you quilt. 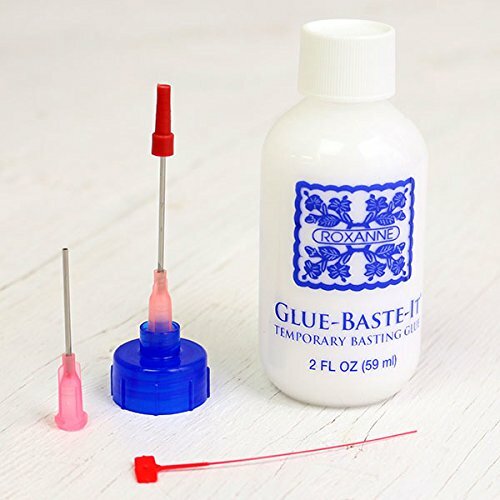 If you choose to use a temporary basting spray instead of a fusible batting, I recommend using 505 Spray and Fix, as I find it is much less likely to gum up your needles and/or cause thread breakage. But as always, use what works best for you! Is the layering process any different with fusible batting? 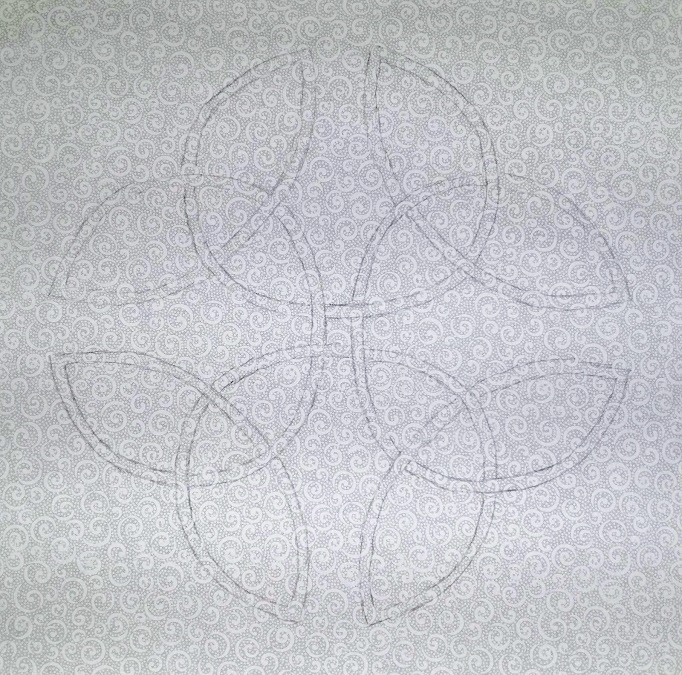 The True Lovers’ Knot (placed on point) from Celtic Quilts: A New Look for Ancient Designs – ready to add borders! This is the seventh in a series of posts that will take you step-by-step through the process of creating a Celtic Quilt. 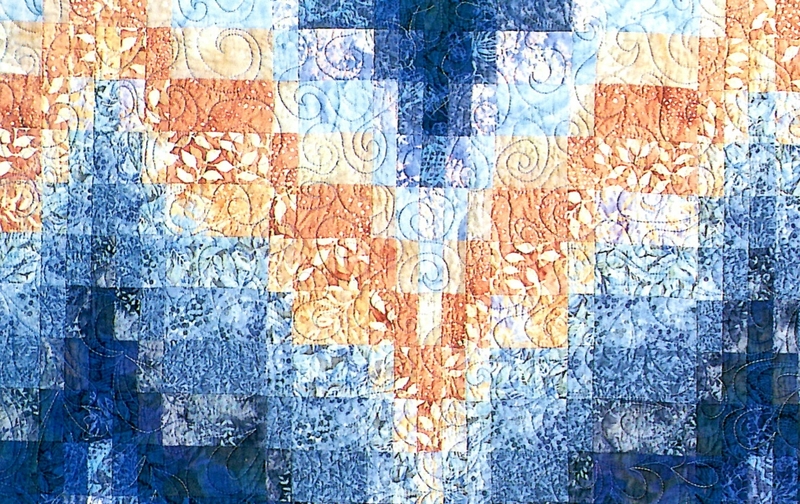 How do you decide whether or not to appliqué and quilt in one step? The main rule of thumb for me is the size of the quilt. 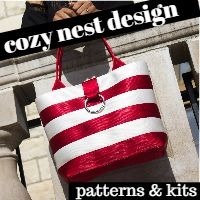 For wall-hangings, table runners, pillows, etc., I always appliqué and quilt in one step. For larger projects such as bed quilts, it depends on if the design has lots of major changes in direction or not. There are definitely times when it is easier to appliqué first and then quilt later! 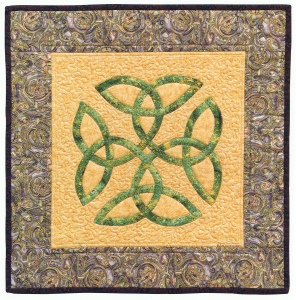 This is the sixth in a series of posts that will take you step-by-step through the process of creating a Celtic Quilt. The lines that form my Celtic and Celtic-style knotwork designs are formed by cutting bias strips of fabric and sewing them into tubes, which are then fuse-basted onto background fabric. The fabric tubes have been trimmed and pressed, and are ready to go. How do you get them positioned smoothly on the fabric? When I first started working with Celtic and Celtic-style designs, I preferred 1/4″ wide strips of Steam-a-Seam2, which is pressure-sensitive and holds the fabric temporarily in place until you press with an iron to fuse it permanently. Some years later, I discovered Roxanne’s Glue Baste-It. 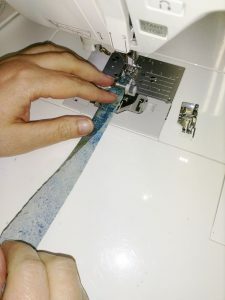 I love that it only takes small droplets of glue to hold the fabric in place, dries very quickly – especially when you run a hot iron over the fabric – and is water soluble, so it is easy to dampen and reposition something if necessary. I have never had any issues with it discoloring my fabric over time when I haven’t washed my samples, but I love that it does wash out. 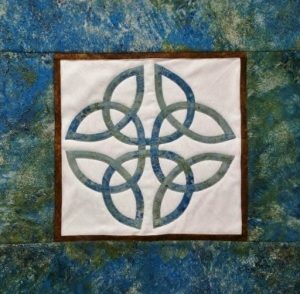 This is the fifth in a series of posts that will take you step-by-step through the process of creating a Celtic Quilt. 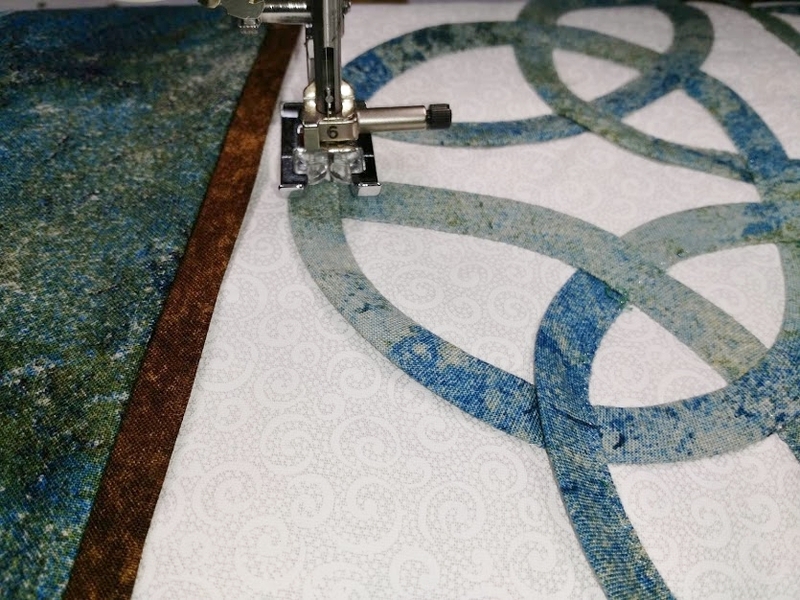 The lines that form my Celtic and Celtic-style knotwork designs are formed by cutting bias strips of fabric and sewing them into tubes, which are then fuse-basted and machine appliquéd onto background fabric. The strips have been sewn into tubes, but how do you hide the seam allowance along the side? Either way, you’ll need a 3/8″ wide press bar. I like these plastic bars the best, as they are economical, do not get as hot as metal press bars, and are more stable than nylon bars. You’ll need a firm pressing surface. My ironing board is slightly padded, so I don’t like using it for this step – I find it harder to get firm creases. My favorite pressing surface is shown below, my omnigrid portable cutting & pressing station; but in a pinch, I’ve even used an empty cardboard fabric bolt! You’ll also need an iron. Avoid steam, as it tends to relax the cotton fibers and may cause the tubes to stretch as you are pressing them – which means they won’t have the stretch you’ll need later. You can use your regular iron, but I prefer to use my Clover Wedge Iron, as it is lightweight and does the job beautifully while being more maneuverable and less tiring for me to use. This is the fourth in a series of posts that will take you step-by-step through the process of creating a Celtic Quilt. 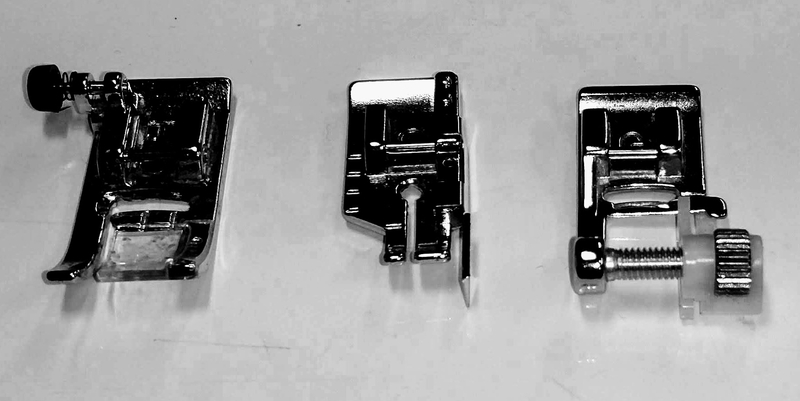 Choosing the right presser foot can make this step a lot easier! 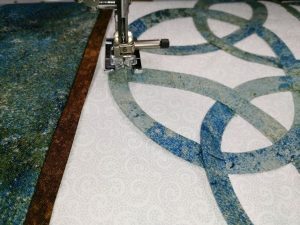 The lines that form my Celtic and Celtic-style knotwork designs are formed by cutting bias strips of fabric and sewing them into tubes, which are then machine appliquéd onto background fabric. If you cut your strips 1 1/4″ wide, you’ll need to sew them with a SCANT 1/4″ seam. 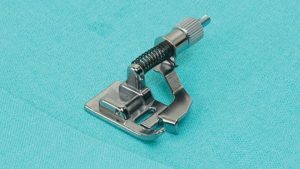 You can use your standard presser foot for this step, a quarter-inch foot, or an adjustable blind hem presser foot, but my preference is to use my blind hem foot, as I can adjust the guide to give me a perfectly consistent seam allowance that is just under 1/4″ wide. A slightly different blind hem foot, this one from Baby Lock. You might also find this same or similar design with a plastic adjustable guide instead of metal one. 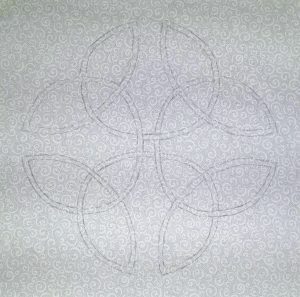 This is the third of a series of posts that will take you step-by-step through the process of creating a Celtic Quilt. The lines that form my Celtic and Celtic-style knotwork designs are formed by cutting strips of fabric and sewing them into tubes. The first thing to decide is how wide you want your finished tubes of fabric to be. I’ve seen many beautiful Celtic-style designs created with 1/4″ wide (finished) tubes, but I prefer to use 3/8″ wide (finished) tubes for a couple of reasons: (1) they are easier to handle, and (2) that little bit of extra width makes it easier to see the color and print of the fabric when you stand away from the design.